First off, the owner of the property is really nice and helpful. We checked in really late with no additional charge. The apartment is clean and comfortable. Will definitely book your apartment again, hopefully, the sea view apartment is available. Clean and good facilities. Recommended. But surrounding amenities not attractive. Amazing stay. The place is clean with a very nice view and very safe neighbourhood. Nearby to starbucks, mini-mart and some nice eating places. Convenient to go to attraction areas. Highly recommended. Its a brand new service apartment without room. Comes with basic appliances ie. Washing machine, fridge, dinning table, and electric cooker. There is no wifi signal in the room. Signal is only in the lobby. There is a tv but no channel at all. 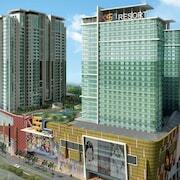 Property is very convenient in terms of food and shopping malls.. Easy communication with owner.. Love it much.. Located in Central District, this condo is 13.4 mi (21.6 km) from Legoland Malaysia.